You are here: Home / Weekly Columns / Opinion / 8 Best Touchscreen Laptops In 2018. 8 Best Touchscreen Laptops In 2018. (ThyBlackMan.com) Welcome to this list of the best touchscreen laptops of 2018. Whatever your choice is, each of the eight laptops here will give you the performance and power you need to work on those small, and big projects. Regular laptops can be found almost everywhere but they cannot match the versatility of touchscreen laptops or 2-in-1 PCs. If you feel that it’s not easy to pick the best touchscreen laptop for your home and work, Netbooknews.com give us the best options. When it comes to choosing a laptop, the most important things everyone looks for are RAM, processors, graphics memory, storage capacity, and the display quality. After reviewing many laptops, the HP Envy x360 15.6-inch laptop appears to be a good package, especially because of its touchscreen capabilities and hardware. The laptop features an edge-to-edge FHD WLED-backlit multitouch display offering 1920 x 1080 resolution. It comes with the 8th generation Intel i7 processor coupled with 16GB of RAM and 1TB primary storage. The HP Envy x360 offers a secondary SSD storage of 128GB and it features an integrated Intel UHD Graphics 620 graphics chip. For gamers and pro users, this is the best touchscreen laptop with top-notch hardware, beautiful design and a backlit keyboard. It comes at a price of $1,049.99. The Lenovo Yoga series is known for beautifully designed ultra-thin 2-in-1 laptops. The company now offers eye-catching back panel covers for the Yoga 920 laptops. The best thing about this laptop is that it is completely customizable so you can make a proper balance between style and performance. The Yoga 920 laptop starts from $1269 and features a 13.9-inch UHD display offering 3840 x 2160 resolution. With the Intel UHD Graphics 620 on board, the Yoga 920 is configurable with up to 8th Generation Intel Core i7-8550U processor, 16GB DDR4 RAM, and 1TB PCIe SSD. The touchscreen laptop supports Lenovo Active Pen 2 which can be purchased separately. The Acer Chromebook Spin 11 is a Chrome OS-powered 11.6-inch convertible laptop. It offers touch, stylus, and keyboard input and runs almost all the Android apps, thanks to its 4GB RAM and integrated Intel HD Graphics 500. In the $300-$400 price range, the Acer Chromebook Spin 11 is one of the best touchscreen laptops in the budget for students and kids as their laptops are often vulnerable to accidental drops, knocks, and water spills. The best 2-in-1 laptop, the Microsoft Surface Pro features a 12.3-inch PixelSense display, elegant design, and a comfortable Type Cover keyboard. With a resolution of 2736 x 1824, the Surface Pro offers fantastic visual performance. Its hardware capabilities make it one of the best performing laptop/tablet hybrid. The Surface Pro can be configured with up to 7th-generation Intel i7 processor, 16GB of RAM and 1TB SSD storage. For the starting price of $799, you get Intel Core m3 processor coupled with 4GB of RAM and Intel HD Graphics 615. Other 2-in-1 laptops can’t match the Surface Pro’s dynamic design and touch experience. It comes with a four times more sensitive stylus, and on high-specced models, its performance is sufficient for power users. What makes Samsung’s Chromebook Pro special is its digital stylus which is the first of its kind in the Chromebook space. The laptop features the same Intel Core m3 Processor that powers many low-spec laptops including the basic model of the Surface Pro. The Samsung Chromebook Pro features a 12.3-inch 360 degree rotating LED display with 2400 x 1600 resolution. The laptop runs on Chrome OS and provides support for 4GB of DDR3 RAM. The major drawback here is that you cannot upgrade the memory capacity on this laptop. The Samsung Chromebook Pro carries a premium price tag, but it is still cheaper than most budget-friendly Windows 10 and Chrome OS laptops. 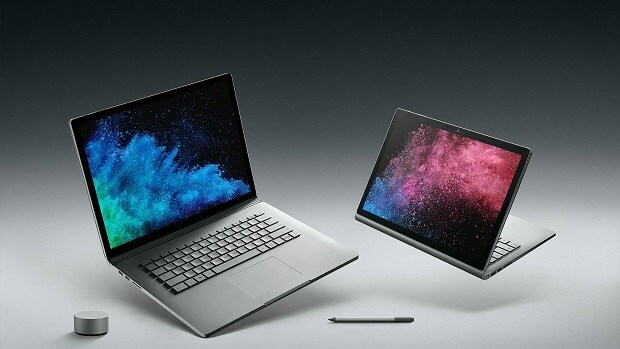 Working on the Surface Book 2 makes you realize that you’re going to have a wonderful experience with the machine. From the moment you register yourself with Windows Hello, you will see how much you can do on a Surface laptop with and without its keyboard. The powerful battery that lasts between 15 to 17 hours after a full charge, doesn’t make you run for the charger every now and then. The Surface Book 2 is available in 13.5-inch and 15-inch display options with the capacity to be configured with up to Intel i7 8th-generation processors, 16GB of RAM, 1TB SSD storage, and NVIDIA GeForce GTX 1060 GPU. If you want maximum performance from this beast, you should be ready to shell out about $3000 for the Surface Book 2. The Google Pixelbook is a 2-in-1 laptop that works as a tablet if you fold its display back 360 degrees. For everyday tasks, its 2.4 lbs weight is obviously not very comfortable for tablet use, but it’s perfect if your main consideration is a laptop you can carry anywhere. The Google Pixelbook supports up to 16GB of RAM, Intel i5 and i7 processors, and 512GB SSD storage. The device runs on Chrome OS and features a 12.3-inch LCD with 2400 x 1600 resolution and 235ppi pixel density which is not so great but slightly higher than Apple MacBook’s Retina display. Dell has trimmed the bulk off the company’s highly popular XPS 13 laptop. The Dell XPS 2018 edition is one of the most beautiful laptops released in 2018. Its bezel-less design provides you with an immersive experience you won’t get with many touchscreen laptops. If you’re looking for a stylish and bold laptop, choose the XPS 13 as it not only features a glass-fiber palm rest but also boasts top-notch specifications. Powered by Intel’s eighth-generation processors, the Dell XPS 13 is a mix of fantastic build quality, design, performance, and battery life. Check for the latest and the best touchscreen laptop deals to get the most benefits.